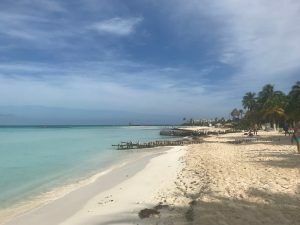 Isla Mujeres, a Mexican enchanted paradise. This island is located about 5 km away from Cancun coast, reachable in a few minutes by boat. The island is 8 km long, perfect size to explore it by golf cart or by bike if you want to do some sport during your stay. 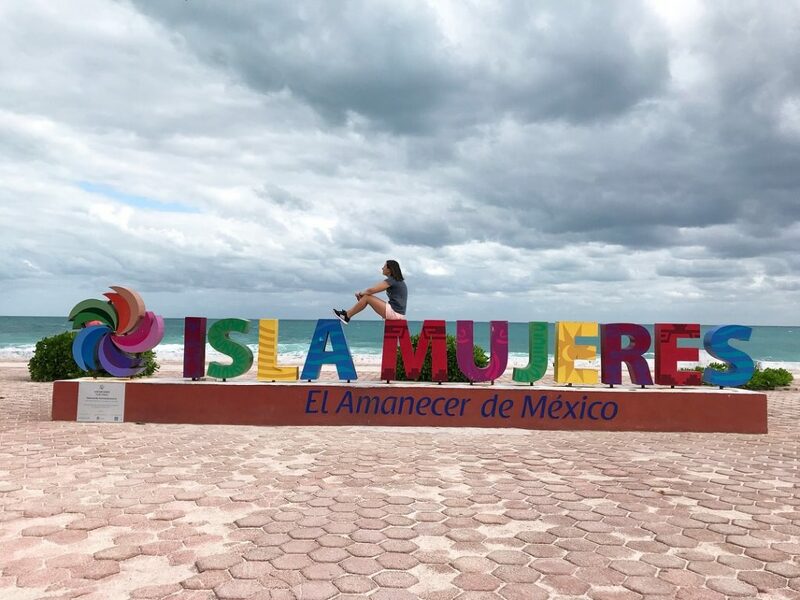 All depends what you want do during your visit, if you want to just see the island 2 days are enough, from Cancun they also offer a day trip to Isla Mujeres. We spent 5 days on the island because we wanted to relax and experience the island vibe. From Cancun you can take the ferry from Puerto Juarez in the Downtown or from Hotel Zone. 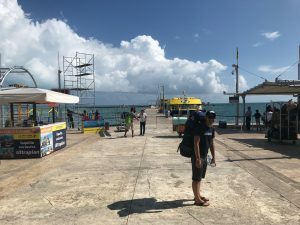 If you take the ferry at Puerto Juarez the round trip with Ultramar ferry will cost you 300 Mexican pesos a little bit cheaper than take it from Hotel Zone which cost about 340 Mexican pesos. Check the timetable on the internet. 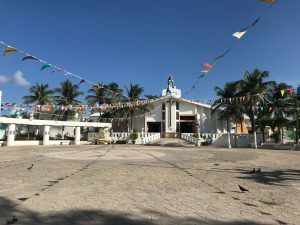 We can say that Isla Mujeres has two Downtowns, the tourist area with charming streets and lots of souvenirs shops and the at the south side of the island where the locals live. Playa del Norte, the most popular beach on the island, rated as one of the best beaches in the world. 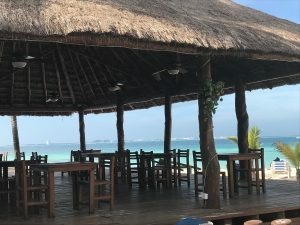 Tips where to sleep, where to eat and drink, what to see and how to visit Isla Mujeres. 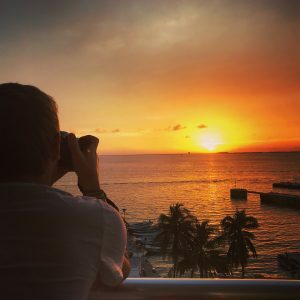 We stayed at Hotel Bahia Chac Chi, it was pretty clean and good located and we could enjoy the sunset view from our balcony every day. Hotel las Plamas is also a good option, very close to Playa del Norte. We try to avoid the tourist places and chose for the local option every time we can. 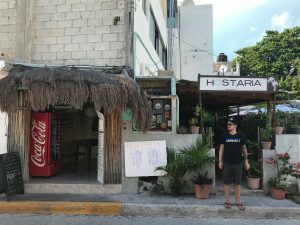 La Hostaria, a local restaurant, you get really taste mexican food for an affordable price. 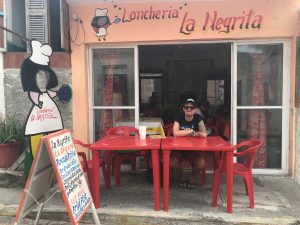 La Loncheria la negrita, another local restaurant, they open just till the afternoon and the home made food is very tasty and more than reasonable. If you are on the island you need to visit those bars, really popular on the island: El jamaicano and Las 3 mentiras. 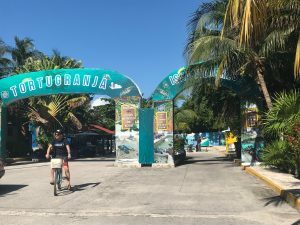 You can discover the work done from people living on the island at The Turtle Farm, visit Punta Sur with its sculpture park and the Mayan temple close to the cliffs. You can also scuba diving at the world famous MUSA underwater museum, definitely one of the major attractions that island has to offer. Isla Mujeres is ideal to explore on a golf cart if you are just staying for a short time, the prices are about 200 pesos per hour or 1000 per day. If your stay on the island is for some days maybe is an option for you to rent a bicycle is cheaper and to the other side of the island is about an hour ride. We rent a bike for several days so we get better price, but if you just want it for a day the price is about 200 pesos. Remember that even for renting a bike you need to leave the passport or driving license as a guarantee. 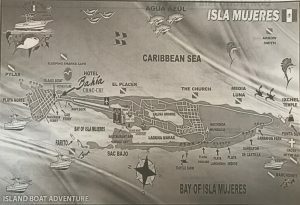 We hope you like our Isla Mujeres Born Backpacker Guide, follow us there is more to come! Next stop after some relaxing days in Isla Mujeres was Playa del Carmen, we recommend you to read our insider tips.